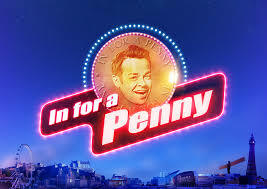 Bother's Bar – Commentary, guesswork and idle speculation on gameshows in the UK and abroad. News this morning of Speedgate, the world’s first AI (with a lot of human help) created sport. Maybe it will become the next Tenball, who knows? So this begs the question (ding!) which game or quiz show most feels like it’s been put together by AI? We’ve not disparagingly compared a show to Quizzlestick for a while. In other news: FOTB Ash the Bash and this quiz show Twitch stream Wednesdays will tonight be taking on Duel from 8pm. This will be live but not interactive like previous games The Wonderwall and 1 vs 100 as far as I’m aware. Do check it out. Reports this morning suggesting ITV have picked up The Masked Singer, we look forward to seeing what level of celebrity they manage to get for it (who’s behind the lion mask? it’s Christopher Biggins!). Also reported, there might be a US version of The Crystal Maze in the works. On the one hand, imagine The Crystal Maze but American. On the other hand, imagine The Crystal Maze but American. Little Lion (of live experience fame) were meant to be expanding into the US, weren’t they? Quietly quite interesting, news broke yesterday that Ryan Reynolds will be hosting a US version of upcoming format Don’t, where families attempt physical and mental challenges in rooms for money whilst under strict instructions not to do something or risk elimination. Anyway this sounds like potentially a fun idea. So obviously looking for inspiration for something to “do” a post about I start looking for gameshows that follow the theme. Don’t Forget Your Toothbrush. Don’t Feed the Gondolas. 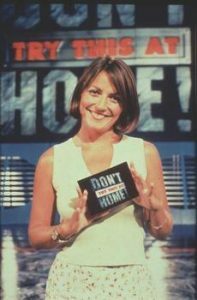 And then I saw Davina McCall holding a question card, so here’s a video of Don’t Try This At Home!